Single use plastic shopping bags are the norm at grocery stores, pharmacies, and big box retailers. They are also a familiar sight tumbling down roads, waving from trees, clogging storm drains, and polluting lakes, streams, rivers, and oceans. First developed in the 1960s, single use plastic shopping bags didn’t become commonplace in U.S. stores until the 1980s – when they were embraced as a cheaper alternative to paper bags. Among their supposed virtues: they required less energy to make and recycle. Flash-forward a few decades: we are literally swimming in plastic bags. The stats are sobering. The Wall Street Journal estimates Americans use and dispose of 100 billion plastic shopping bags annually. According to the Environmental Protection Agency, less than 5% of plastic bags are recycled. On average, plastic bags are used for 12 minutes. Many wind up in the municipal solid waste stream. Bags in landfills take up precious space, while incinerated bags release toxins into the air. When plastic bags make it to single-stream recycling facilities, they can bind machinery meant to handle hard plastics, metal, and glass – increasing the cost of recycling. 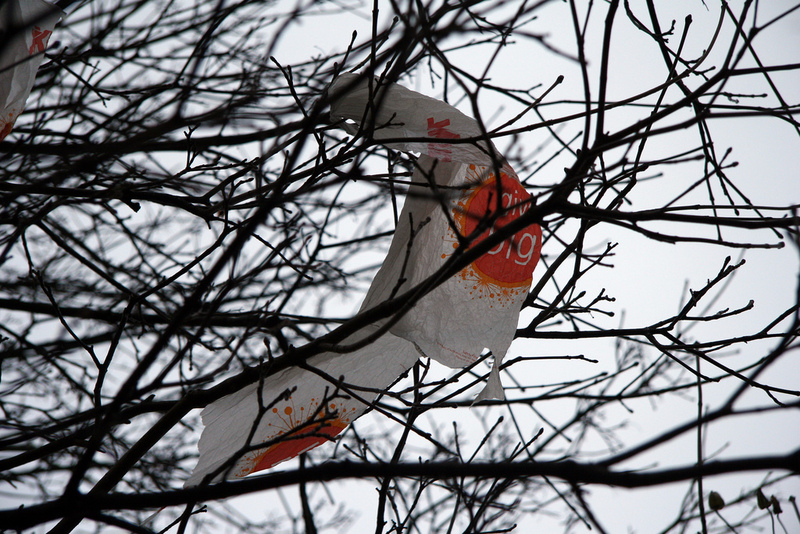 Unleashed on the environment, plastic shopping bags ensnare birds, turtles, and aquatic mammals. When they photo-degrade, they pollute the aquatic food chain. Aquatic animals mistake micro-plastics for plankton. The enormous quantities of plastics in our rivers, oceans, and Great Lakes have unknown consequences for the health of wildlife and ecosystems. Individual behavior can make a difference. The Natural Resources Defense Council reports that American families each take home some 1,500 plastic shopping bags a year. Do the environment a favor: commit to using reusable shopping totes. Photo, posted December 28, 2008, courtesy of David Gasi via Flickr.